While I was thrilled to suddenly have mangoes, cherries, passion fruit, guava, berries, and other fruits in abundance, I also realized that they were going to go to waste unless I did something with them. My husband bought me a canning set from the hardware store, which came with a great instruction book, and I learned how to can. So, why should you learn how to can? Folks, if I can make jelly, so can you. After making a batch of mango jam a couple of weeks ago, my neighbor said, "I want to learn, but all that sterilizing and boiling and stuff intimidates me." It's not like you need a sterile laboratory. You do need to follow the steps closely, measure ingredients, and time the stages. That's it. Besides dealing with our own produce, it is not unusual for a neighbor to show up with a bag of fruit. Sometimes at a farmers market you will find a great deal on large quantities. If you learn to can, you can put those mangoes, berries, apples, or whatever to good use. We have even made white wine jelly, which is delicious and can be made from very inexpensive white wine. Wise Bread's Thursday Bram has shared a great mint jelly recipe, complete with very easy instructions. People seem to enjoy receiving jams, jellies, and chutneys as gifts. I love the fact that they are all done well before the Christmas "rush." It is also really nice to have an inventory of gifts ready to go for emergencies. I just made mango jam, which cost me .25 per jar. The cheapest mango jam I could find to buy was $2.49 a jar! That's a pretty amazing savings. I know, that sounds silly, but it's true. Learning how to preserve food really is fun, especially if you are a person who likes DIY projects. Some DIY projects take up a lot of space, so when I started canning, I was a little worried about that. However, all of my equipment fits nicely in a 58-quart plastic storage container. My canning kit included a black granny-ware canner (yes, that's a funny description), a jar lifter, a funnel, 12 jars with lids and bands, and the Ball Blue Book canning guide. It was about $65 five years ago. The sets are widely available in hardware stores and on the Internet. The Ball set is extremely well-made and it has held up beautifully. My neighbors all bring back their empty jelly jars, as well as others they collect, which is very nice. I rarely have to buy new jars. You can often find canning jars at yard sales, and you can even get reusable jar lids now. My mother's best accidental creation was dubbed "Plum Runny." Meant to be plum jam, something went awry, so we tried it on pancakes as syrup. It was amazing, and from then on, she just made Plum Runny. I personally have a store of Lilikoi Syrup in my pantry, which is similarly fantastic. In some recipes, if your jelly hasn't set, you can simply re-make it, to get the consistency desired. 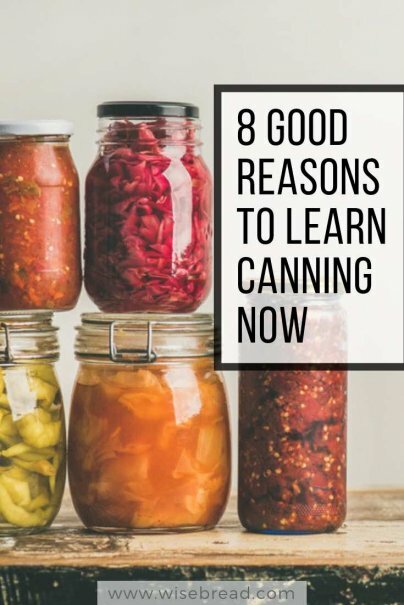 There are great books out there for beginning canners, and the Internet has loads of information. I would love to hear what kinds of preserves you have made — please share in comments! We don't eat much jam, so for us, freezing any extra garden stuff is a better option than canning it. There would be no reason to can anything store-bought. Hi, Jenny! Thanks for chiming in. Have to disagree w/your second sentence, though. The money that can be saved . . .
Actually Jenny, I buy produce when it is in season (carrots, potatoes, apples, pears, etc.) and can it for year round use. I used to freeze it until I had a freezer full of food go bad because the freezer wore out. I haven't bought tomato based anything for more than 5 years because I can my tomatoes from my garden whole, then I make sauce, paste etc. I love canning! I just followed the directions in a package of pectin when I got started 4 years ago. My most requested jam is Strawberry Vanilla. It's strawberry jam made from the pectin instructions with the addition of one vanilla bean, split in half lengthwise that goes into the pot to boil with the strawberries, and you take it out as you put the jam into the jars. It's just different enough to be unique, and just normal enough that everyone loves it! Apple pie filling in a jar was also a big favorite--just request some help for slicing all those apples! Hi, Guest! Tx for your comment and may I steal your strawberry vanilla jam and apple pie ideas? ;-) That apple pie mix would be a great Christmas gift! My mother had some sort of gizmo for peeling and coring apples. That'd probably come in handy for this recipe. Thanks for sharing! Last year I picked up one of those new Ball jam-cookers at Target on the clearance aisle (a slow cooker just for jam and jellies) and I love it! No worries about burning, boiling over, anything. I've made much more small batch jams than I ever would have before. I generally steer clear of "unitaskers" but this one makes sense for me. I've noticed lots of new canning magazines, books and blogs out as well. I like foodinjars.com. "There would be no reason to can anything store-bought," Jenny? That's a pretty absolute statement for which I can find numerous exceptions, such as the time my grocer had a lot of peaches with slight imperfections marked down by 75%. Also, there are lots of things to can besides jellies and jams, as the picture under the title suggests. Guest, your Strawberry Vanilla jam sounds delicious! Carlie, I agree, that Strawberry-Vanilla jam sounds killer. So true about produce mark-downs. Yesterday I got a big bag of lychees - lychee chutney, here I come! 3 years ago, I started gardening and canning again after a 10 year absence. It has been well worth the time and energy. Our health and wallet has benefitted because of the effort. Food just tastes better homegrown and canned. I've also recently started canning vegetable soup and chicken stock. It takes a little time to prepare but I like the convenience of just opening a jar and cooking instead of having to thaw frozen soup or chicken stock. Karen, you have my admiration - I have yet to can chicken stock. That better go on my bucket list. ;-) I love knowing exactly what has gone into my food and being able to pronounce all of the ingredients. After reading how bad canned tomatoes are for you, I'm looking to start canning my own. I'm hoping my kitchen garden yields a good amount this season so I can get to work!! Hi, Nicole! My neighbor grew tomatoes and peppers (lots of them) just so he could make his own canned salsa. He grew it all hydroponically and his yield was amazing. As I write this I am staring at a tomato plant with just one flower on it. I hope my yield is better than that. ;-) Good luck to you, and thanks for commenting. We've only made jam but it was an interesting process and not near as difficult as we anticipated. The jam was used for a baby shower and the ladies loved it rather than getting some trinket they would put on a shelf or in a drawer to collect dust. The jars were labelled and decorated. I think with a bit of research, trial and error canning is a great way to save money in the budget and to have good food all year long. Thanks for the baby shower idea - I really like the practical aspect of that! Great article! Almost inspires me to get busy and do some canning! I've thought about canning several times recently. I remember my Nana use to can goods growing up. We would play in her cellar and there were rows and rows of jars on her shelves. Hi, Mary. I remember that too, and how it was the "norm" in many homes. I am sure you could do it! An easy way to get your jars back is to first take the rings off before you give them away, and then tell folks that if they want more, they have to bring the empty jars back to you. It's worked well for me for the last 10 years. Hi! That never occurred to me (duh). Enjoying your blog, BTW. Thanks for writing! I had canning equipment- waterbath style and hardly used it. I canned pears once, that I got free from my neighbor's trees. The time to peel and can them wasn't worthwhile even getting the fruit free. I still needed pectin and sugar. I could have written a few articles in the 6 hours it took to peel and can one batch of pears. I canned tomatoes once and same thing. The time it took to process, it is less expensive for me to use that time to write a few freelance articles and buy canned tomatoes at my local store. I gave away the canning stuff, because after I calculated the expense, I never bothered with it again. Hi, Guest, and thanks for writing. You raise a couple of good points. If something is very labor-intensive to process, you have to admit: time is money. You have to decide if that's how you want to spend your time and energy, too. It doesn't sound from your comment like you enjoyed the process, which makes a difference, too. Canning is definitely work - some enjoy it; some do not. Canning does take forever when you are first starting out. It's with a lot of practice that you develop your own efficiencies and it gets a lot quicker!